Today’s mold repair micro-welding laser industry is characterized by rapidly changing, ever-evolving customer demands and intense competition. Innovative ideas, successful designs and a strong commitment to superior quality and performance are the fundamentals of LaserStar Technologies Corporation. FiberStar 8700-2 Series Fiber Laser Welding Workstations offer state-of-the-art laser resonator technology which provides high peak power, optimal performance & throughput, higher up time, enhanced electrical efficiency, and a space saving air cooled design. Solid state diodes provide instantaneous power with no “warm up time” required. Operators hold parts in their hands while viewing the application through a stereo-microscope in the welding zone. An internal cross-hair allows the operator to easily align and weld the parts at the correct location. 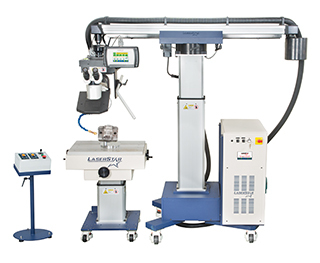 The Universal Jig Fiber Laser Welding Workstation offers a significant, competitive advantage for today’s operators looking to unleash the power of hot light, benefit from a comfortable, ergonomic design and ensure optimal platform flexibility for the widest range of on-site mold repair welding applications.